I always have pint jars of chicken noodle soup in the freezer. With the arrival of fall, soup is one of my favorite lunchtime meals and Roasted Chicken Noodle Soup is my all-time favorite. 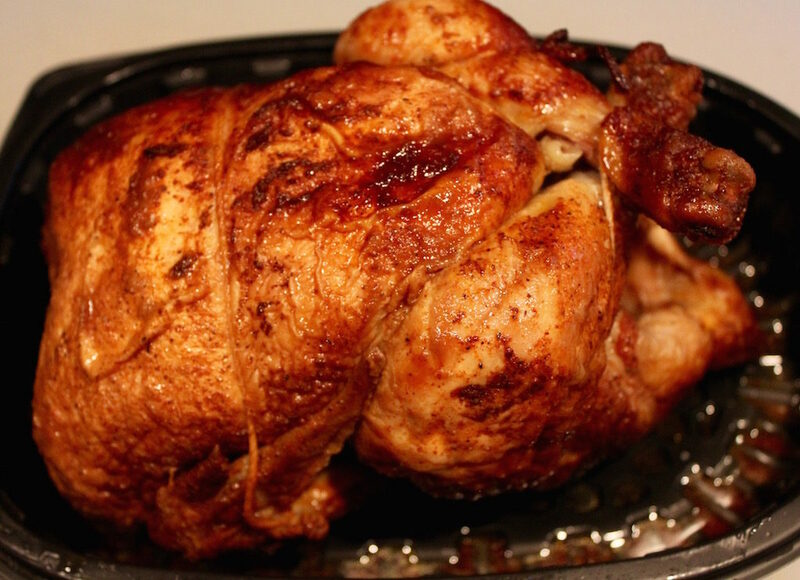 My quick and easy method to restock the freezer is to pick up a store-made rotisserie-roasted chicken. Every store has them these days and in general, they are all delicious. Take the cover off the roast chicken when you get home to let it cool a little while you prep the stock. 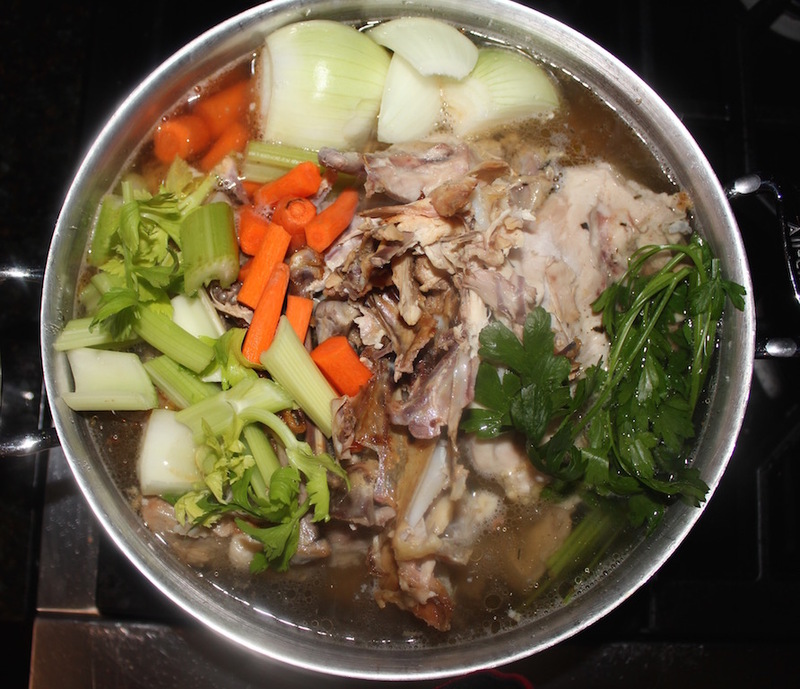 Whenever we have a whole chicken I freeze the carcass for soup. I happen to have three in the freezer plus the one I just purchased. 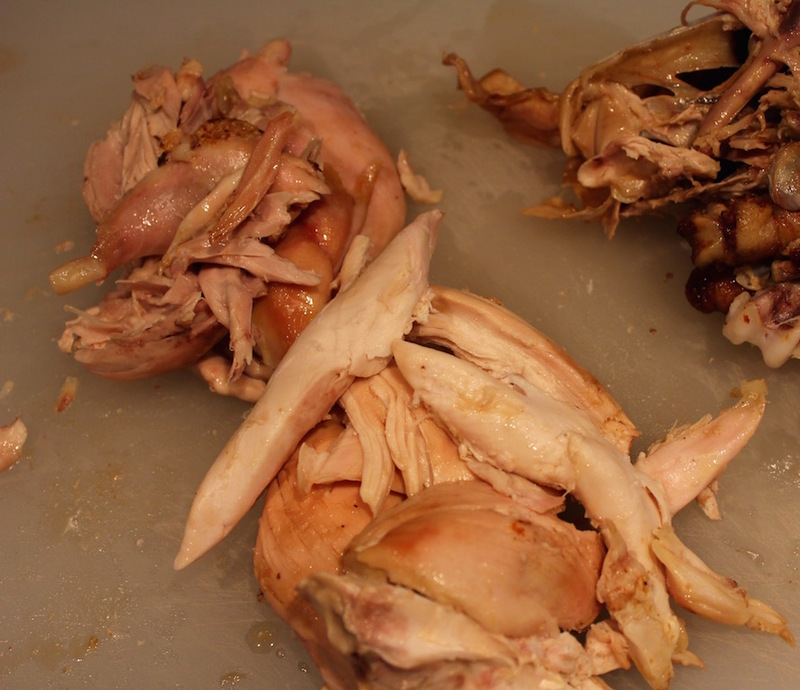 Pull the meat off the chicken and place the bones in the pot with the frozen ones. Substitute a couple of pounds of chicken wings in lieu of the bones. Make sure to use the bones! Quarter up a couple of onions, chunk up three celery stalks and three carrots, add a few sprigs of parsley and a half dozen peppercorns. Cover this with cold water and bring to a gentle simmer. Continue cooking for a couple of hours, occasionally skimming any foam from the top of the broth. Thinly slice four celery stalks and four carrots. 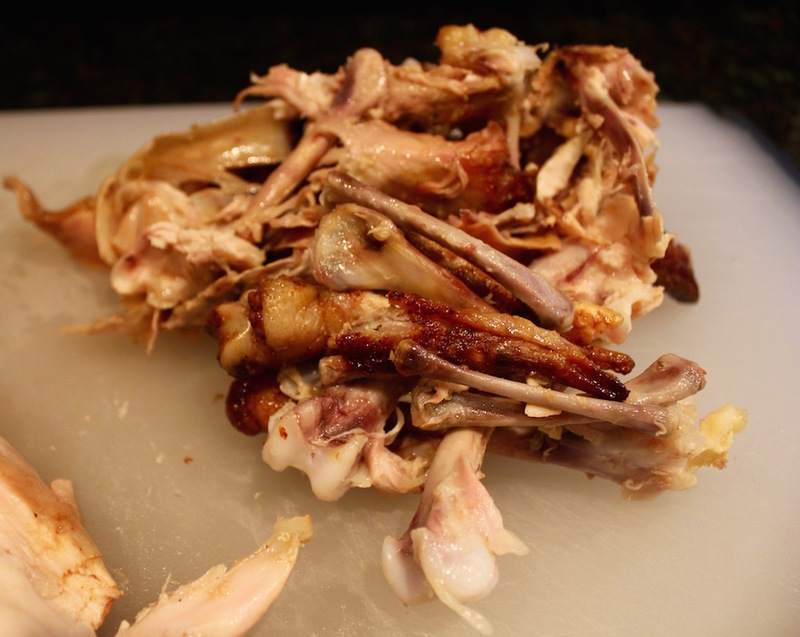 Cut the chicken meat into bite-size pieces; you should get about five or six cups. Strain the chicken stock through a sieve into a clean pot in batches and be sure to press down on the chicken and vegetables to get all the juices. 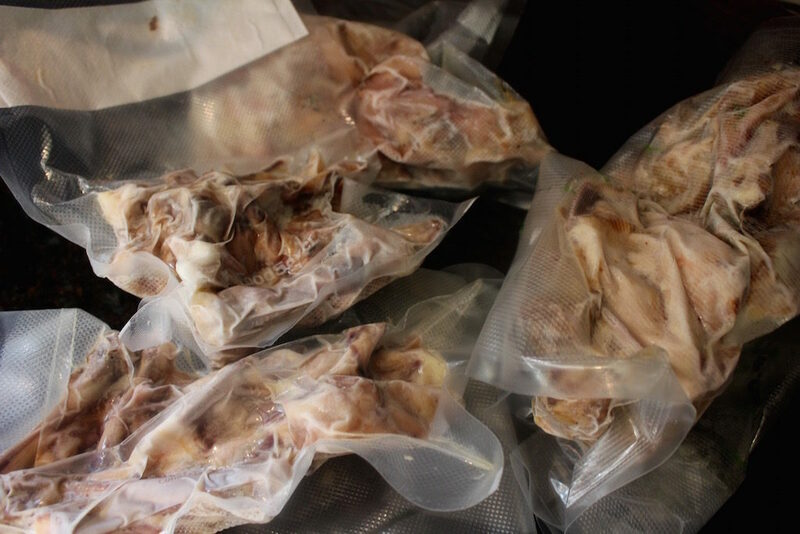 If you have used frozen pre-cooked chicken bones, residual salt may have flavored the stock. Give a quick taste to check before using the recommended amount in the recipe. If you have used chicken wings, you can cool and refrigerate the stock overnight to defat in the morning before continuing with the recipe. 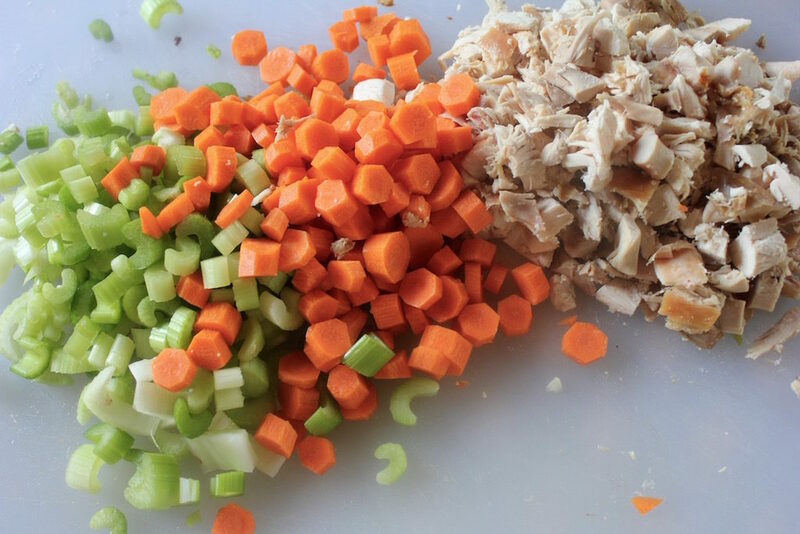 Add the celery and carrots to the stock and bring to a gentle boil and cook for 15 minutes. Stir in the chicken and the noodles and cook until the noodles are done (check package instructions for timing). 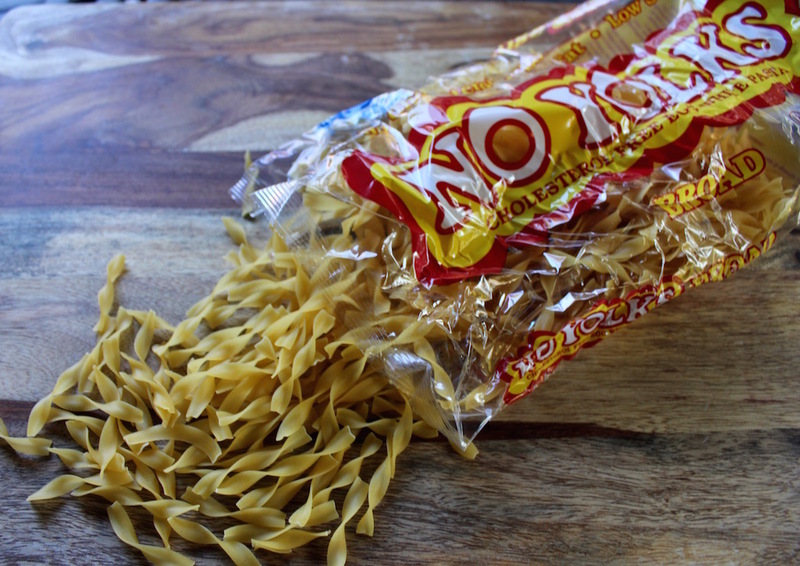 I prefer the yolkless noodles; they don’t get as soft as an egg noodle. I like my soup on the drier side, lots of noodles and less broth. If you like a brothy soup (lots of liquid) cook the noodles separately in salted water and then add to the stock. They will absorb only a modest amount of the stock. If you have used frozen chicken, residual salt may have flavored the stock. Give a quick taste to check before using the recommended amount in the recipe. Let the roasted chicken cool slightly and then pull the meat off the bones. 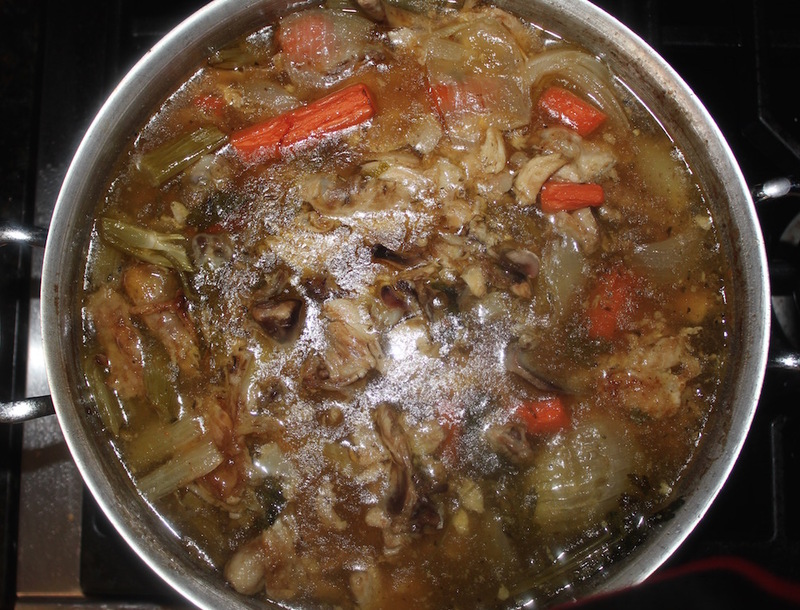 Place the chicken bones, onions, celery, carrots, parsley and peppercorns in a 7-quart Dutch oven or large pot, cover with cold water and bring to a gentle simmer. Continue cooking for a couple of hours, occasionally skimming any foam from the top of the broth. Add the carrots, celery, salt and pepper and bring to a gentle boil for 15 minutes. Stir in the chicken and the noodles, return to a gentle boil and continue cooking according to the timing on the noodle package.